This magical book is exactly what I’ve needed after a steady diet of bleak and haunting novels which comprise the IFFP long list for 2014. Not that I don’t grow from, or often enjoy, bleak and haunting. But I felt it was time for a book for Spring. For rejuvenation. For hope. The house at which Alba mysteriously arrives one night, after being evicted from King’s College, is a house which moves and breathes. It drops mysterious notes meant specifically for its inhabitants, some of which include ghosts. And it allows conversations with the likes of Daphne DuMaurier, Sylvia Plath and Dorothy Parker as well as many other famous women authors. Penguin is offering to send one reader a paperback edition of this book (U.S. only, please). And for everyone there is a lovely reader’s “kit” here, complete with recipes, discussion questions, and a conversation with author Menna Van Praag. Simply leave a comment below to enter the give-away, along with your email if you will. Update: the winner of The House at The End of Hope Street, selected by random.org, is Andi of Estella’s Revenge. Congratulations, miss Newly Married! I know what you mean about the IFFP! Back to Back and the Long Road and I am also ready for something less bleak. This one sounds promising. Wouldn't it be wonderful if that house were real? this does sound marvelous indeed! This sounds like a much kinder version of the house in The Shining Girls. Thanks for holding a giveaway! OMG, I might have to order this one TODAY. It sounds so good and so right up my alley right now. You know I need a bit of magic and this has been on my list for awhile now. I should pick up a copy. That sounds like a very interesting read! Oh it sounds lovely! For days when you need a pick-me-upper. I have a thing for stories with houses that breathe, like The Little Stranger, although that's a totally different feel from this. Oh my! Win or not I know I must add this to my list. Certainly it would enchant me — these wonderful stories entwined in fascinating lives — and perhaps even the book club, too! I wish I lived in that house. 🙂 The book sounds lovely, I will put it on my TBR and look for it at the bookstore. Unfortunately I can't participate in the giveaway as I live on another continent. This sounds like my kind of book! After reading your lovely reviewing and seeing Marisa de los Santos' comment, I know it's one I have to own!! Ooh…I liked the cover, I was intrigued by the living house, and then you had me at conversations with Daphne du Maurier, et al. Oooh, I love a book with a magical touch. I just recently read one in which there were odd little touches of magic: The Taste of Apple Seeds by Katharina Hagena. 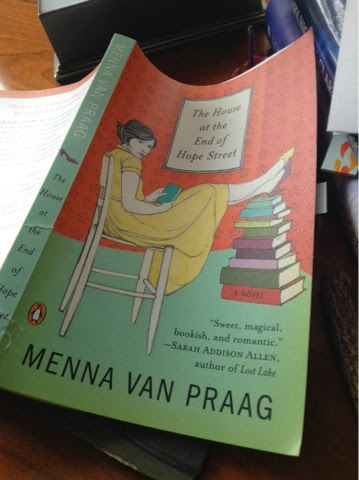 The House at the End of Hope Street sounds like a softer, kinder book than The Taste of Apple Seeds (which is a translation from German – you might enjoy it). I want to live there! What an adventure coming home would be!